Massive thank you to TaysideHealth for the opportunity to write this guest post. 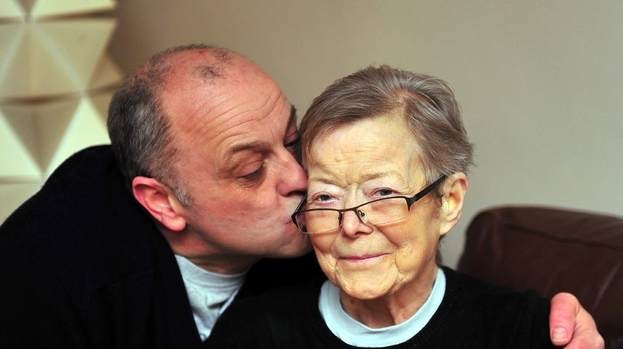 My name is Tommy Whitelaw and for five years I was a full-time carer for my mother Joan, up until she sadly passed away in September 2012. At the time my Mum was diagnosed with Vascular Dementia, I looked after her and thought to myself “It’ll be okay, we’ll get through this”. What I soon learned as her carer, was that dementia was an unpredictable illness which brought many challenges and forced us to adapt to the ever-changing routines. Many days we would wake up to discover that everything we had grown accustomed to have suddenly changed again. I wondered whether the struggles I faced were mine and mine alone and how other carers who had been through the same journey as I was embarking on, had managed to cope. This was the basis behind my first venture in to the world of awareness raising – the Tommy on Tour campaign, which involved collecting life story letters from people across Scotland caring for a loved one with dementia. I was soon to find we were not alone in facing the struggles we felt inside but also how much many kind caring people there are out there who do so much to make a difference for the lives of people they meet. This is something I am passionate about promoting as I build on my previous awareness raising work, as Project Engagement lead for the Health and Social Care ALLIANCE’s Dementia Carers Voices Project. Part of my early campaign was a walk around Scottish towns and cities for a week to collect life stories; this included and was my first visit to Tayside as a campaigner. Stopping off at both Dundee and Perth this was a new, and I have to say quite scary, world to me, both my mum and I were ve ry lonely, lost and scared. The week’s walk involved being away from mum for the first time in years and brought its own fears and anxieties. Arriving in Dundee (a very rainy Dundee) to visit the local Alzheimer Scotland Resource Centre to speak about my campaign I noticed there was a talk that evening on Dementia at Ninewells Hospital and I made a wee detour to put some leaflets out about collecting life stories. As I arrived at the hospital lecture theatre two ladies approached and asked if I was the man walking round towns and cities to collect letters (I had been lucky to have been on the news that lunch time). I replied that I was and one lady put her arm around me and said “Thank you so much for doing this. My husband has dementia, thank you for speaking up”. Suddenly I was not so scared, anxious or wet from the rain, in fact I received letters from both ladies sharing their life stories and experiences. That welcome and supportive arm has continued in so many ways from Tayside. People across the area have been of great support to me both personally and to our Dementia Carer Voices project and to our You Can Make a Difference Tour over 2014 – 2015; speaking at hospitals, universities, colleges and in local communities asking people to think of one thing they might do to make a difference to the lives of people living with dementia, their family and carers. We have been so lucky to meet and receive so many pledges from people across Tayside and the passion and desire to make a difference has been so inspiring from the next generation of nurses who attend Dundee University and Abertay University with their wonderful pledge wall. 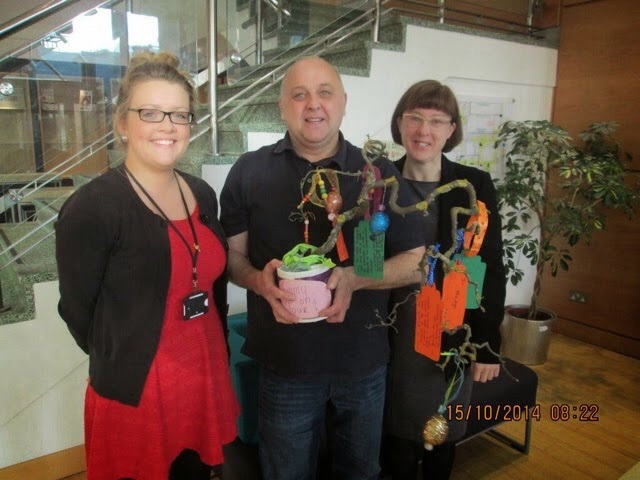 The incredible AHP Pledge tree that Shelagh Creegan has created sent me home one day with a smile in my heart. This work continues this week with 4 talks on March 12th at the Kingsway Care Centre with Shelagh and a talk that evening with a former Abertay Adult nursing student, Rachel Johnston, who at her own cost and time is hosting a Make a Difference event for her new nursing colleagues to attend. 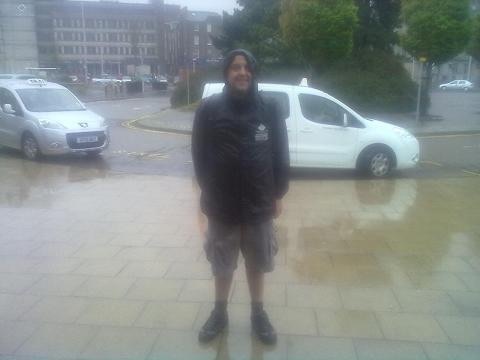 This blog piece started with a very anxious and nervous son arriving in Dundee on a very rainy day and two ladies putting their arm around him and making him welcome. The last time I was in Dundee the wonderful Shelagh was there to both welcome and look after us for the day and will be there again this week to stand by our side. This tour is all about making a difference and thank you Tayside for making a difference to my life and our campaign. Dementia Carer Voices has now gathered 3100 pledges as part of the You Can Make a Difference campaign. The campaign encourages people to listen to the experiences of people who have cared for a loved one with dementia and to think how they can make a positive difference in people’s lives. The team are delighted to have gotten such a strong response, and would like to take this opportunity to reflect on our journey up until now and how we have gotten to this point. A fundamental aspect of the campaign has been about involvement. Throughout the tour, we have engaged with many thousands of health and social care professionals, students, MSPs and members of the public, and have noticed a distinct increase in the number of pledges we have received when people are encouraged and supported to do so by colleagues and friends. We would therefore like to ask you to share this campaign, to encourage people you know to get involved and make a pledge to make a difference in the lives of people who have dementia, their families and carers. Through our own dedicated blog site, Twitter account and website, the campaign is easily shared, and links people to a range of information. Pledges can be submitted via email, Twitter or on the blog site, and are also collected at every talk. We would very much appreciate it if you would promote this campaign; the talks and our films and encourage people to reflect on what they can do and how they can make a difference. You can view our NEW PLEDGE FILM launched for 2014 with First Minister Nicola Sturgeon CEO NHS Scotland Paul Gray and Chief Nursing Officer Fiona McQueen here. This entry was posted in Uncategorized and tagged Campaigns, carers, Dementia, Life stories, Pledges. Bookmark the permalink.